Dear friends of the Hotel Tyrolerhof! Pure fun, day after day. We have renovated our dining room. With the cozy niches and the modern buffet, it invites you to recharge your batteries in the morning and round off the evening's culinary delights. Today we would like to show you our latest offers! We completed the renovation in 2018. Cozy niches, bright natural colors, local woods and noble materials are just a few aspects. Of course, you can expect regional cuisine in buffet form and an excellent wine list! 007 ELEMENTS is a world-first — a cinematic installation dedicated to the world of James Bond. 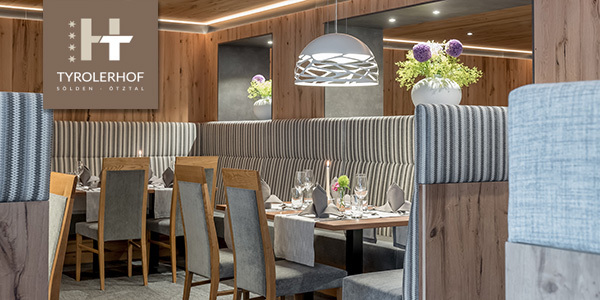 It is housed inside a beautiful, bespoke building designed and constructed by Obermoser inside the summit of the Gaislachkogl Mountain in Sölden, more than 3,000-metres above sea level.